Doing all the justice to these titles, John Grimek turned out to be one of the finest professional bodybuilders that the world has ever seen. This is clear from the fact that he had never lost a contest in his career. He undoubtedly had the best physique and was by far the best-built man of all times. John Carroll Grimek was born on 17 June 1910 in New Jersey, United States. He was active in the 1930s and 1940s as a professional bodybuilder and weightlifter. He is still known as one of the strongest bodybuilders that the world has ever seen. He always had a passion to be as strong and muscular as the strongmen he admired. If, you too, look up to him and admire him, take a close look at John Grimek’s diet and his workout Routine. Amongst his earliest of influences, was his older brother George, who had a set of weights and often trained with his friends. From an early age, he was fascinated by weights and began playing around with them when he was just 12 years old. He won the “Mr. America” title for two consecutive years! His personality and physique were so impressive that the rules of the Mr. America contest had to be changed after his two consecutive wins to prevent him from dominating the competition. John’s influence was such that bodybuilders and weightlifters and even people from other walks of life looked up to him. He was a true champion and a heartthrob of millions of people around the world. John Grimek combined the basic compound movements with a range of single joint exercises in his workout regime. Grimek was the first person to propose the 3 X 10 training protocol, which has now become the signature workout style of many athletes. He followed a pyramid fashion of exercising whereby he gradually decreased the number of reps while increasing the amount of weight. He believed that one’s body responds best when trained as a whole. According to him, he never believed in sticking to a set of exercises for months or years. Even if he did the same exercises each day, he would do them slightly differently. He analyzed his body from time to time and worked on that part which, according to him, required development. For instance, if he felt that he needs chest development, he would put extra effort in chest work. However, he would always do a lot of squatting, no matter what part of his body he is currently focusing on. So he focused on the parts which required a little more attention while doing his regular workouts, differently each day. By looking at his easiest workout routine, don’t get fooled thinking that since it is a basic, easy and oversimplified workout routine, it will not reap fruitful results. This is indeed one of the most effective and attainable workout routines that will give you results which are beyond your imagination. Chin ups or pull downs – 10 reps. Standing calf raises- 10 reps.
Repeat the above exercises for a total of three times. Incline press or dips- 10 reps.
Barbell row or dumbbell row- 10 reps. Single arm preacher curl- 10 reps.
Repeat all the above exercises except Abs for a total of three times. Chin ups or pull downs- 10 reps.
Incline dumbbell curls- 10 reps. Stiff legged deadlift- 10 reps.
Repeat this circuit for a total of three times. John Grimek firmly believed that one’s body needs time to rest and recover from the intense workout. Hence, he suggested working out intensely, only three days a week. On the rest of the days, give your body some time to rest and your muscles to recover. Another thing that he suggested is to keep your workout as intense as possible. Resting for far too long between two circuits is not advisable. A break of 45 seconds- 1 minute is enough between two sets. Also, take a 2-3 minutes break between two exercises. John felt that it is important for a person to have full control over his body while working out. The reps should, therefore, be slow, and controlled. Make sure to finish the reps smoothly. Hurrying into completing the reps would not work in your favor. Take care of your body posture while exercising. Try to add weights whenever possible, to further intensify your workouts. John followed a pretty much basic diet plan. He advised taking a balanced diet to fuel the muscle recovery and growth. Consider including whole milk, peanut butter, honey, raisins, red meat, fish, eggs, cheese, and lots and lots of fresh fruits and vegetables. Try to increase the protein content in your diet as much as you possibly can. Take a diet overloaded with nutritious food. Also, drink plenty of water because it is a prerequisite to keep your body healthy. So basically, John tried to include nutritious and wholesome foods in his diet plan. He, however, believed that the quantity of food that a person should consume differs from person to person. Even if two people have the same height and weight, their eating capacity may differ. Since everyone’s metabolism and activity levels are different, one may eat in smaller quantities and that is completely alright. Eat healthy food, in the right quantities, and as per your body’s requirements. Everyone knows his/her body’s capacity and requirements so it is better to stick to them. John did not follow any particular diet plan as such. He just tried to keep his diet all healthy and inclusive. John was also one of the very first promoters of supplements, protein powders and Get Big Drink. He felt that there is no harm in getting something extra from these supplements that otherwise normal food did not provide enough of. So, you might as well consider taking them. John Grimek was a man who combined massive muscular development with world-class strength and power in such a manner that the world has never seen before. 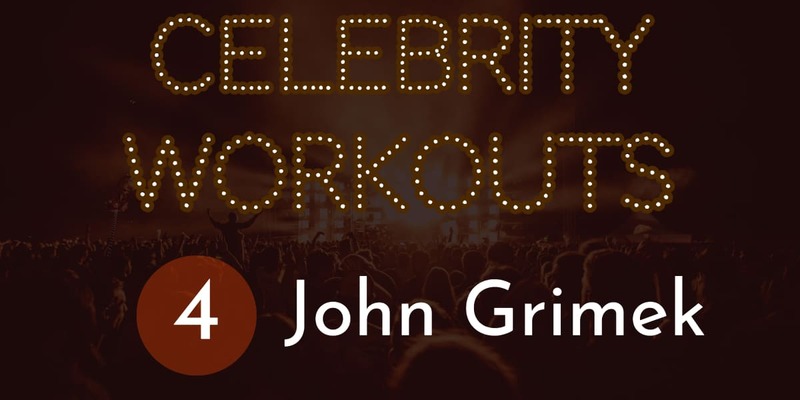 I hope you have inspired by John Grimek’s workout, right? The power and grace that John exuded were impeccable. He was not just an ordinary bodybuilder but an icon in all true senses. He made the entire world believe that even the easiest of exercises if done with full dedication, will give you results that you cannot even imagine. Grimek firmly believed that one should always include those exercises in their workout regime which induce deep breathing to enhance one’s overall health, energy, and well being. John Grimek’s diet and workout plan is very effective and is also attainable. Unlike the other modern era full body workouts, John Grimek’s diet and workout plan are basic and hence easily achievable. Trying out this plan will definitely help you to build strength, develop your muscles, and fuel the overall well being of your body. Exercise religiously, eat healthily, drink plenty of water, and give enough rest to your body to get a good physique.